The European Union is fast becoming a more serious global player on security and defence issues, but there is still an “enormous” amount to do as it wrestles with old and new challenges, including responding to technological change and threats from terrorism, cybercrime and disinformation. 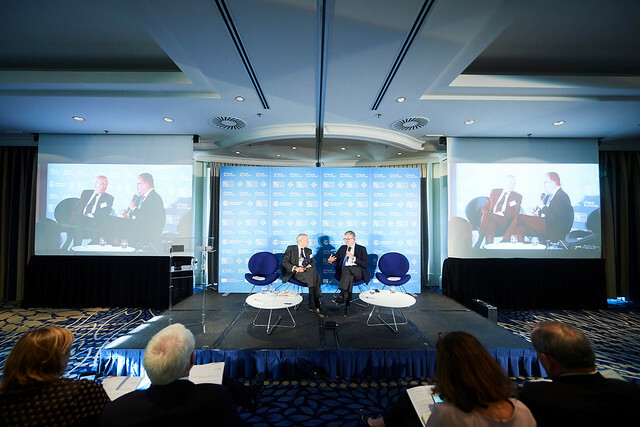 That was the view of European Commissioner for the Security Union Julian King, who opened a gathering of experts at Friends of Europe’s annual Policy Security Summit in Brussels on 20 September. Under the banner ‘A Brave New World: adapting to a changing security landscape’, wide-ranging discussions on the most pressing issues of the day included the potential benefits of increasing EU strategic autonomy; Brexit’s impact on the state of play; ethical questions around unmanned weaponry; and Europe’s position in the ‘arms race’ for use of robotics and artificial intelligence. The question is “Is Europe upping its game? And if not, how can we catch up?” said Jamie Shea, Friends of Europe’s Senior Fellow and NATO’s outgoing Deputy Assistant Secretary General for Emerging Security Challenges. Can we even consider ‘Europe’ as an entity when we talk about defence, asked Lowri Evans, European Commission Director-General for Internal Market, Industry, Entrepreneurship and SMEs. With members states’ defence industries all organised differently there is too much “duplication of resources, and mas-sively inefficient investment” which needs to be resolved with better collaboration at the development stage, she said. Meanwhile Europe is “sitting back” on the issue of fully autonomous weapons, said Mary Wareham, Global Coordinator of the Campaign to Stop Killer Robots. During a candid debate on the development of unmanned weaponry, she said their campaign to preemptively ban such weapons was gaining traction but questioned why Europe remained undecided. Amid multiple issues “what binds us together is this moral question of how you should be killed on the battlefield – by another soldier... or by a machine?” she said. For NATO’s part, panel members were asked what it needs to do to modernise, face new challenges and work with the EU towards common goals. The event also featured roundtable discussions on some of Europe’s biggest foreign policy challenges, with sessions on Syria, Libya, North Korea, Ukraine and Yemen. The programme was devised as a response to recommendations resulting from Friends of Europe’s re-cent global online brainstorm, Debating Security Plus, the conclusions of which were shared with delegates.